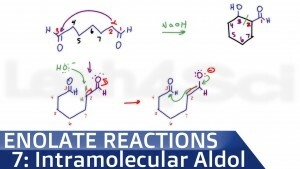 Intramolecular Aldol condensations happen when a single molecule contains 2 reaction aldehyde/ketone groups. When the alpha carbon of one group attacks the other, the molecule attacks itself forming a ring structure. This video shows you how to identify the correct alpha carbon and carbonyl will complete the most stable ring as well as how to quickly identify your intramolecular aldol product before working through the mechanism itself.